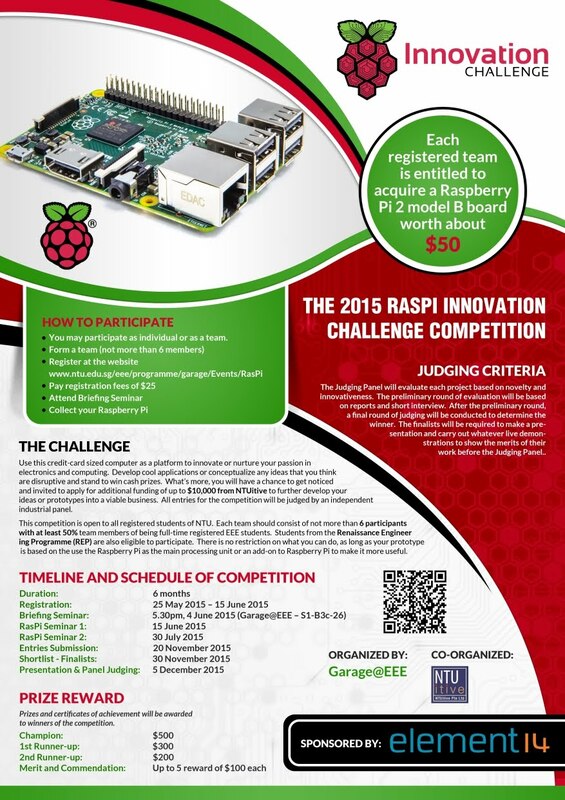 Please be reminded that during the period of The 2015 Raspi Innovation Challenge Competition, there will be 2 Raspi Seminars that participants are encouraged to attend (non-participants are also welcomed to attend)​ . The second seminar will be held 16th September 2015 (Wednesday). ​To help in the logistic planning, please register (by 15th September 2015) your attendance for the event below. The Raspberry Pi presents a really exciting platform for building IoT projects. It’s tiny, cheap, and provides interfaces to low-level hardware, enabling you to integrate Internet-enabled smartness with a variety of hardware gadgets. We’ll see examples of how solutions are built around Raspberry Pis, and how you can build fascinating projects of your own. Mr Lai Zit Seng is the Senior IT Architect at School of Computing, National University of Singapore, where he is principally responsible for IT infrastructure services. His portfolio includes data centre, network, server, storage, and security operations. He is an active supporter of open source projects and occasionally tinkers in hardware, including Raspberry Pi.